Apparently, Netflix heard their subscribers' calls for more true-crime and are diving deep into the serial-killer abyss by sinking their claws into another Ted Bundy-focused project. 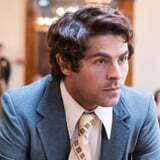 The Zac Efron-led Extremely Wicked, Shockingly Evil and Vile premiered at the 2019 Sundance Film Festival to fairly positive reviews and, according to The Hollywood Reporter, Netflix is closing in on a deal to bring the feature film to the platform for $9 million. That's serious cash to spend on a Sundance acquisition (though not as much as Amazon paid for Mindy Kaling's Late Night), but the purchase would make sense. The streaming service already has Conversations With a Killer: The Ted Bundy Tapes, a four-part miniseries that examines Bundy's life and crimes by using public statements, archival footage from the trial, previously unreleased interviews, and present day interviews from experts, all to paint a fuller picture of just what kind of monster Bundy was. Extremely Wicked, meanwhile, focuses on Bundy's crimes and trial from the perspective of Elizabeth Kloepfer (played by Lily Collins), Bundy's longtime girlfriend. Instead of focusing on his crimes, the film depicts how easily fooled many people were by Bundy's charismatic manner - especially Kloepfer, who eventually turned him into police after spending months in denial. By viewing Bundy from her point of view, the film aims to reconcile the disarming smooth-talker Bundy was seen as with the depraved serial killer he actually was. The Ted Bundy Tapes and Extremely Wicked were both directed by Joe Berlinger so, when the deal goes through, Netflix will have a fictionalized account of Bundy's crimes and a more comprehensive look at his reign of terror from the same Oscar-nominated director. Extremely Wicked is expected to get an awards-season theatrical run in Fall 2019.